Having a farm today to support a family, and hopefully make a decent profit, means: hard work, good marketing, management skills, and keeping politically informed. The dairy business for example, is very complex, and it is getting more difficult to compete with the very large dairies. The farmers must take responsibility and get involved: engage in elections, attend related meetings, and be advocates for their business and their industry. Some politicians names appear in the news as agricultural activists. Watch what they accomplish and then form your own opinions. A NY political figure who voiced concern was that of former (R) Senator from Central New York State, Nancy Larraine Hoffmann, Chairwoman of the Senate Agriculture Committee from 1999 to 2004. 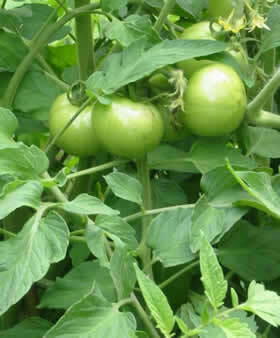 The Senator said, "Agriculture is the backbone of our state's economy and, in fact, is New York's number one industry. Helping New York's 38,000 farm families is one of my top priorities." US (D) Senator Charles E. Schumer, once named "Man of the Year" by the NY Farm Bureau, said, "...the value of agriculture and farming goes beyond the dollars produced. Farms are the incubators of the values that made this country great. Reliance, a love of nature and individualism are all bred on farms and then the values spread." At a campaign debate, Schumer said, "I love the farmers. They're great". The New York Farm Bureau is the State's largest agricultural lobbying/trade organization. Its members and the public know the organization as "The Voice of New York Agriculture." New York Farm Bureau is dedicated to solving the economic and public policy issues challenging the agricultural community. The NY Farm Bureau names NY State Legislators annually into its “Circle of Friends” list. The "Circle of Friends" honor is based upon each legislator's voting record on issues of agricultural importance as well as other evidence of legislative support, including sponsorship of bills that New York Farm Bureau has either supported or opposed during the most recent legislative session. To see who's on the latest “Circle of Friends” list, visit the “Press Room” at The NY Farm Bureau website http://www.nyfb.org/news_and_events/Press_Releases_79_pg.htm and look for the press release on that subject. There have been all sorts of federal programs to help dairy farmers with pros and cons such as the Milk Income Loss Contract (MILC); fighting to restrict imports of milk protein concentrates (MPCs), and the MPP (Margin Protection Program). Representing the Northeast, local farmer, Ken "Mr. Milk" Dibbell from South New Berlin, NY, has voiced his concerns on Capital Hill in Washington, DC, about the economic struggles of today's dairy industry. There are many agricultural issues, so the modern farmer has to stay educated with the latest findings. Oxford is one piece of the puzzle. Keeping up with the latest farming news and opportunities is more important today than ever before, so we have collected a short list of resource and aid sites for today's farmer. It's also important to attend Chenango County Agricultural Development Council meetings (open to the public) at the Cornell Cooperative Extension of Chenango County at 99 N. Broad St., Norwich. The ADC, funded through public support and donations, works to support, promote and expand agricultural activities within Chenango County. Nearly everyone is growing something in Oxford. Some people get elaborate with man-made ponds and aquatic wildlife, some are interested in butterfly gardens, some cultivated flowers like roses or irises, while others grow fairly large vegetable gardens with exceptional hybrids. Some people still "can" their own goods, and tap their sugar maple trees to make their own maple syrup. They're all for personal pleasure. Below are just a sampling of some of the people in Oxford who have combined this pleasure with business and seek to make a profit. Holler Farms is a successful farmstead in Oxford, NY, because owners Mina Takahashi and husband, Marco Breuer, do things the natural way: they practice sustainable farming methods. They grow a diverse bounty of organic vegetables, fruits, and herbs; cultivate mushrooms; raise bees and chickens; make cider, maple syrup, and honey; and harvest wild seasonal foods. Their agricultural philosophy is to work with nature and its seasonal cycles to preserve the land's healthy condition for future generations. There's the "Century Farm", Marshman family's, "Tiger Lily Holsteins". 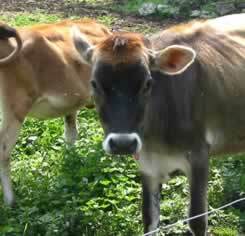 They're located on County Road 32, 3 miles South of Oxford Village, milking over 350 registered holsteins daily. Just down the road is Kim Marshman's (self-service) farm stand called "The Barnyard". The stand is stocked with sweet corn, tomatoes, peppers, squash, onions, fresh-cut flowers, pumpkins, and Marshman's special "Black Gold"-compost, from mid July - October, 7 days-a-week. She also has fall decorating supplies and much more. School Tours are available. For discerning shoppers, right in LaFayette Park is our own Farmers' Market. Local entrepreneurs set up stands selling fresh produce and hand crafted wares. 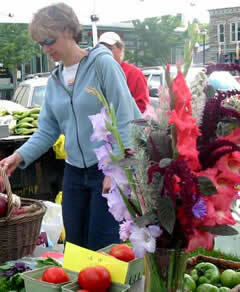 In addition to fresh vegetables, depending on who shows up, you may find: home grown fruits, eggs, flowers, herbs, etc. You may find a table of hand crafted items, sheared wool, or home made goods such as jams, canned fruits, or canned vegetables may also be available for sale. (There's no cost to the vendors to set up.) It's well worth a visit to meet the farmers and see what's the best, freshest, and most unique! Come early for best choices. You'll find the Market on the Northwest side of the Park near the Bandstand. The Farmers' Market is open on Saturday mornings from 9:00am - 12-Noon, from mid July through October. There are two noteworthy businesses located on Race Road. One is another family owned farm, the Weidman Farm. John V. Weidman owns and manages the working farm as well as specializing in rural land improvement and development. He's available for contracting, consulting, water diversion and development, site development and equipment sales. The other business provides reliable service to farmers when machinery breaks down-- Kuhn's Equipment Repair. Kuhn's repairs tractors, radiators, and other farm equipment. Their goal is to help farmers maintain their existing equipment with preventive maintenance, painting and other major repairs. Serving the needs of all, from backyard flower gardens to fields of corn, is Canal Street Hardware, a Trust Worthy Hardware store with McDowell & Walker dairy products. They've got mowers, manure, Muck shoes, mulch, and much more. They also carry agricultural feeds and supplies. It doesn't matter if you have acres to tend or simply one tomato plant to cage, Canal Street has it all. If you have gardening questions, be sure to ask Ken, Nancy, or their knowledgeable staff. They're sure to be able to help with those "stubborn weeds and pests", but I don't think they've come up with a cure for the problematic rocks.